Anyone built a Bren MK3? Anyone know if semi auto receivers are available for these? The kits I've seen include torch cut receivers but I can't tell if they are capable of being welded or not. For no good reason I can think of I've always wanted a Bren. Because they are TOTALLY cool!!! I had one, regrettably I sold it on this forum last year. I only sold it to buy my dream house, I've wanted a Bren gun since I was a kid & I REALLY miss that gun. But I got a HUGE house out the deal & an incredible school district for my kids. It was the right move @ the time but I find myself wanting another one. 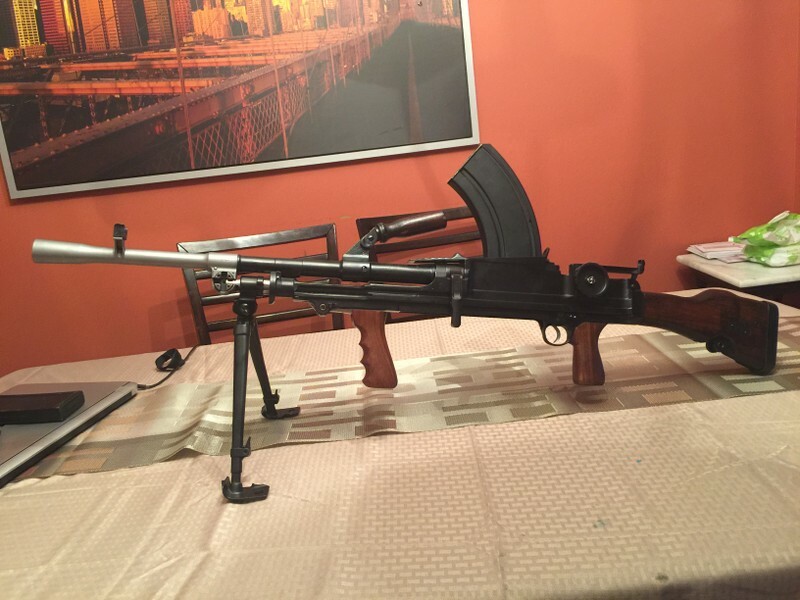 My [former] Bren was built buy SMG guns & they really did an Awesome job but they are only doing their FG42 guns now. It's a shame too because I would buy another from them in a heartbeat. Here is a pic of the one I had. Last edited by Near Sighted Sniper; February 23, 2018 at 17:43. I have a reweld semi i did out of a mk2 kit, Kate looks pretty good,the weld scars add character and she runs and 'behaves' most of the time. I need a new striker to refit to her. Sadly i have not taken her out in years, cant take the chance of her misbehaving and get hassled. First time it happened an old range guy came over and said' having a little trouble' said yea,testing her out,not sure if itsthe indian ammo or the striker is over running.. he said he actually had a garand that would behave like that once in a while..eventually sorted it out. He was cool. Nowadays i will probably get ratted out by some ignorant tool. Now i just need to get to my Yugo M53 kits.. but think i will be having to sell one of them. No semi receivers but the demils are rebuildable. Lotta work tho. Those Sarco kits are pretty tempting and I already have a pile of Mk1's and Mk2's. Best price I've seen in quite some time and the receiver sections don't look horrible. Yeah, The Sarco kits are the ones I was eying, Not a terrible price as kits go. Thanks for posting the pics stimpy and Near Sighted Sniper. Those nice examples make me want one more now. Besides, I've still got a bunch of .303 south African ammo I bought years ago "just in case". Don't worry Near Sighted Sniper, that Bren will be admired, taken care of, and shot in due time. Why in the world did you weld the selector to the lower?? It was part of the approved semi mod. Ah. Must be more than 1 type of semimod. I did not weld my selector,just welded a walled booger to prevent it from flipping to 'fun' . Also mine is striker fired instead of a "tuning fork style hammer fired" version that was out there. I got my striker from project guns way back when. Which kits were considered irreparable due to the cut positions? Weren’t those Royal Tiger? has anybody actually seen the Sarco kits to ensure they are buildable? I have built 6 or 7 MkIIs and sold them all. I sold the jig and am now setting on a crapton of .303 !Gotta' get a bolt gun. What’s with the big rectangles? Bolt blocks? That large? One buyer left a review on the Sarco site said his mk3 was converted to 308 but the mags and barrel are 303. Pan back up to the pre-weld pics and you can see I made the blocking bar go BEHIND the text on the receiver. I just couldn't bear losing that. So the bar has full wall penetrations fore and aft of the text section. Same with those who weld selectors, that's insane. Well,supposedly you can run a,762x54r reamed in a bren barrel,get a zb39,cz39,something like that,magazine maybe trim a bolt face a little and you can fire 762x54r through them. Of course you cant reuse it,gets fireformed and beatup,toreup. Sorry im lagging on machine gun model that uses the topfed 54r magazine,im at work. It is a derivative of the zb26,which the bren descended from... yup the brens lineage comes frome a czech machinegun. Btw, my bren has the pins welded in the receiver in the front ,1 each side. Also had to weld fill the rails in the front ,grind back the rails on the lower so basically no major part of an unaltered kit will fit without modding. Are you thinking of the Lahti M26 in 7.62x53 ? Nope,there was a version of the czech zb26 ,think it was called the zb39 that used a mag that was curved similar to the bren,fit the mag well of the bren but was chambered for the 762x54r. I need to google foo it and get a link to info and post. I have done a modded 54R bbl, it worked fine. This was the (original?) Jumani build approval letter, so I did what it said to do. Yeah, the mags for the 54r have much more curve, I had planned to hack a spare bren mag just above the start of the sidewalls and do the same to the 54r mag and weld them together, but I don't shoot it much so I lost interest.